Wild Diamonds Fun casino James Bond casino Royale style. Blackjack, roulette, with Casino Royale theme for casino party. FAQ means frequently asked questions. Please read our FAQ list about Brisbane Fun Casino and Wild Diamonds Fun Casino parties and events. These are some commonly asked questions about various subjects covering all areas from start to finish. We cover all areas as best as possible, but every function is individual, if you have any questions that are not entirely covered by the FAQ list, please contact us via the contacts page. If you have questions about how to play the casino games, please go to our “How to Play” tab on this site. There you will find very detailed descriptions of our games as well as pictures of the tables. 2. It’s different, will a Fun Casino be something people will enjoy? Who enjoy’s a Fun casino? In our experience, a Wild Diamonds Fun Casino is an evening which will leave your guests talking for a long time. It’s authentic and glamorous, and the fact that people are not gambling with real money is what makes it so enjoyable. As this type of entertainment is interactive guests are able to get fully involved. It’s a great ice breaker, especially if you have separate groups of people such as different departments. We often work with large businesses, where staff have not met each other. Whilst at the gaming tables they will get to know each other as they celebrate their wins together. We don’t hold events for children’s birthdays or events aimed at children. We are happy to have them participate in the games as no real money is involved. This is obviously subject to parents (or guardians) approval. Our minimum age for a birthday party is 16 but we recommend 21. A Casino party It is very different to other types of entertainment, but can complement other forms of entertainment. A perfect example is a Great Gatsby night. The night might have casino tables with a 1920’s theme and a jazz band playing to the side. So for a spectacular event, that will not be forgotten, book a Wild Diamonds Fun casino. Entertainment that is suitable for Birthdays, Corporate events, Staff functions, Awards nights, Christmas parties, Weddings / Anniversaries or any other gathering you can think of. Some people will say that a casino night encourages gambling. Exactly the opposite, we give new players the opportunity to learn how to play the games without risk. Our staff will often help them to play in a way that increases their chances of winning. We always explain that a real casino will take their money and they should not play unless they are aware of the odds. 3. What if we don’t have a venue for our Fun casino? Venue options for a Fun Casino. Wild Diamonds Fun Casino can often suggest a venue (or several) that may be suitable if we are given a brief outline of your requirements i.e. room size, type of food required (if any), location etc. There are many venues that we have dealt with, of various sizes. We can offer you a venue with BYO or a cruise or just a local club or pub function room. If you give us an idea of location and number of guests we can then give you some options. Please see our venues page on this website. We can provide pictures in many cases of a fun casino set up within the venue. We have worked at many venues around the Sunshine Coast, Brisbane and the Gold Coast. A variation of venues are suitable with great service and food. Wild Diamonds have worked in many of these venues on multiple occasions. We would particularly recommend Aussieworld for parties and events on the Sunshine Coast. We have found them very helpful to our clients in planning and setting up functions. The Aussie Wold Shed is large enough for the biggest of groups and is also able to be “shrunk” for a smaller group. Call their events team to arrange a viewing. We look forward to being of service to you whatever venue you choose. 4. What if my guests don’t know how to play? Will they have fun at a casino party? If my guests don’t know how to play, Will they still have fun at a casino party? Yes, absolutely. Our professional, friendly dealers are more than willing to teach the games to your guests. It’s a great time for people to learn and practice because “it’s not real money!” Our dealers are also there to entertain and help guests feel relaxed, especially if casino gaming is something new to them. Our games are slightly skewed in the favour of the player where we can so it is more likely that they will win. That increases the enjoyment and excitement even more. There have been instances where guests at our functions have enjoyed themselves so much, they have made plans to go straight to the real casino. Unfortunately, Jupiters casino and Treasury Casino will not bend the rules like we do, but at least everyone will know the general games rules from playing with us. You will notice we have a how to play page which will give instructions about the general casino play as well as each individual game that is currently available at a Wild Diamonds Fun Casino. 6. Is there a minimum number of tables I must have? Does Wild Diamonds Fun Casino have minimum table requirements. No. At Christmas time we are very busy & have a minimum booking of 2 tables. This is through November and December for Fridays & Saturdays. Other days and times of year can be one table. We do make recommendations on the number of tables based on the number of guests. It is probably not really worthwhile to have 1 table at an event with 100 guests for example. It would be detrimental as many players would not get a chance to play and those that are would be very squashed up. We will offer our advice to make your event as successful as possible, but at the end of the day “the customer is always right” which means we will work with you what ever you decide. Room size, budget constraints or other factors may limit your casino size. We will still ensure your event will be memorable for your guests no matter what. 7. Where should I have my casino function? You will need a space large enough to accommodate the number of tables and people that you are planning to host. A casino function can be held at home, a pub, club, resort, boat, event centre or other venue. They can be held indoors or outdoors, but outdoor events need a backup plan in case of inclement weather. To accommodate casino table and players allow 3m x 2.5m for a Blackjack table, and 4m x 2.5m for a Roulette or Poker table. The Money Wheel is same size as a Blackjack table, but will neet to be out from the wall an extra 1.5 m to allow for the wheel behind the dealer. It is up to you as the party planner to decide where you will have your casino function. If you want some advice, we have a venues page. On this page you will see some possible venues and if available some pictures. Please note that we can recommend these venues as we have done casino functions there before. We are not affiliated with any of them. You will need to make your own arrangements in regards to food, drinks and room hire. Feel free to contact us so we can offer assistance. Can I just rent casino tables from you? Will Wild diamonds rent casino tables without staff. No. we do not rent casino tables, we supply a casino experience which includes casino tables with dealers! Below we will list several reasons why we do not rent casino tables. The equipment is designed to be used by qualified croupiers with the correct dealing skills. If somebody who does not know what they are doing tries dealing on our casino tables they cannot maintain a smooth flowing game. Your guests will most likely become bored with the slowness and possibly agitated at the constant mistakes and lack of knowledge of how the real casino games are dealt. The equipment we use, is not always easy to obtain, we cannot risk having it misused and damaged. Even worse is if our equipment was to be misused causing injury. Our liability insurance would not cover this situation if we are not there. You may be liable for multi millions of dollars in damages if you rent casino tables. Guests who see somebody dealing behind tables emblazoned with our logo, may think that they are our staff members. This will give the impression that we are unskilled. This may have an impact on our reputation. We do however allow our guest to have a deal under our supervision during our events. Our dealers will deal and entertain at the same time to ensure it is a “Fun Casino”. Our reputation is our #1 asset. We are sorry to disappoint. We can assure you that even though the cost is a little higher, you will have a much better time enjoying your party knowing that the tables are being run by real dealers with real dealing skills. Can we play with real money at a Fun Casino? Real money?……..Strictly, NO. It is illegal to play with real money at any Fun Casino. There are huge penalties for both the Fun casino operator and the venue, so please don’t ask as the answer will be no. We supply real dealers, real equipment and a real casino experience, but no real money. Wild Diamonds Fun Casino will supply ‘fun money” which is either generic or custom fun money if you have paid for a package. This is the only currency accepted at our tables. Please see below for some examples. Wild Diamonds Fun Casino fun money. This is the back of all fun money we supply. Wild Diamonds Fun Casino Money surfer. Brisbane Fun Casino James Bond Fun Money. We have many versions of James Bond money to choose from. Brisbane Fun casino Fun money. Homer Simpson body for a fun Buck’s night or birthday party. Wild Diamonds Fun Money for Corporate Events. Your Logo on money of any colour for any event. Do I get a refund if the party ends early? No, we do not offer refunds if the party ends early. All Brisbane Wild Diamonds Fun Casino events are based upon a 3 hour minimum. Times are agreed upon and an acceptance is signed before the event takes place. We have never had a party end early. If we notice that most players had lost their money early or it is slowing down a bit, we will take appropriate steps to ensure the event is a success. Sometimes this means giving everyone another note to continue playing. Sometimes a booking is made for only 2 hours or maybe 2 1/2 hours. Unfortunately many of our costs are fixed and most dealers wont want to dress and travel for less than the minimum 3 hours. For this reason, the booking costs will still be for a 3 hour duration. Do I need a Casino licence to hold a fun casino? No, Brisbane Wild Diamonds Fun Casino is an entertainment company. If the event is a fundraiser charity event, you may need to be a registered charity. This may involve getting a permit (may vary depending on the charity). You must not make a personal gain from any funds raised, nor offer a prize of any value (we supply a trophy). The sole reason for guest’s attending is entertainment. Please email us to ask for a government fact sheet. If you are hiring our fun casino for a wedding, corporate event or party then it is simply a case of booking and paying for the Casino Fun event hire. A casino licence is not required since there is no real money at any of our Fun casino events. The owners of Wild Diamonds Fun Casino hold casino manager licence’s, we will not do anything to risk it. We will never deal with real money….so please don’t ask us. 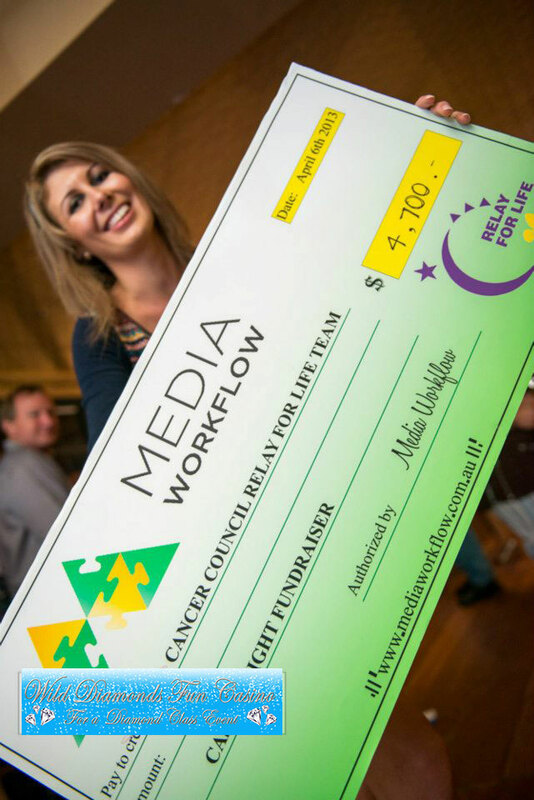 How does a Brisbane Fun Casino fundraiser work? Raise money for your charity using a Fun Casino Fundraiser. Brisbane Wild Diamonds Fun Casino is happy to work with non-profit charity groups for help raise money for worthy causes. A Fun casino fundraiser is a great way to entertain your guests whilst raising some much needed funds for your cause. We will do all in our power to maximize your fundraising efforts. Please see our separate ‘Fundraising’ page for some ideas. An entry fee to an event can (and should) be charged. There are strict regulations to abide by, but it is easy to stay within the rules. It is against the law to allow your guests to use fun money to purchase or win money or valuable prizes based on the outcome of the Casino tables. At no time can real money be accepted over the tables (no exceptions). An auction can be held alongside the Fun casino games, but should be independent of the games. In other words, the winnings from playing the games can not be used to purchase prizes at auction. Raffles can also be held whilst the games are being dealt. Our dealers will pause games to encourage players to purchase raffle tickets through the night when a seller approaches. How far in advance do I need to book my party? The more notice you give us, the more likely it is that we will be able to accommodate you. We have had some customers give us 1 or 2 days notice and others give us 18 months. We prefer the latter!! Wild Diamonds Fun Casino will do its best to accommodate your needs no matter when you contact us. We have a large supply of equipment and staff. We can staff multiple events on the same night. It is rare that we have to turn down events due to lack of resources, but obviously, the sooner you know the date of your event, the better it is to guarantee availability. Holiday periods, November / December and Friday and Saturday nights, are the most in demand and 3 to 6 months is not too early to guarantee availability. Don’t forget that your venues also get booked early during the holiday season. In order to reserve your date, you will need to return the booking form with as many details as you know at the time, and pay the deposit. If cancellation occurs, the deposit will be returnable based on our T & C’s. As soon as you make your decision to have a casino party, you should book. How long does a Brisbane Wild Diamonds Fun Casino event last? Wild Diamonds Fun Casino and Brisbane Fun casino’s offer 3 hour events as standard. 4 hour casino events are quite common and are charged at a rate of 25% extra. In order to get maximum value, we suggest planning dinner, awards, presentations, and other activities to take place before or after the fun casino event. Casino play usually ends 10-15 minutes before the designated ‘close’ time. This allows time for players to cash in their chips and be awarded the trophy. If you would like to extend your casino event during the night, please approach one of the casino manager at least 1/2 hour prior to close. All croupiers will then announce to their players that the time has been extended. We need to make the announcement to ensure no players go “all in” thinking the casino is near the end. They would then have no chips left to play the next hour. Most of our croupiers are able to deal for an extra hour or two without prior arrangements. For a 5 hour or more event, croupiers may need a short 10 min break and or refreshments to keep going in an energetic and enthusiastic manner. How much does a Fun Casino party cost? whether or not your function is located within the Sunshine Coast, Brisbane, Gold Coast area. Please use our contact page to obtain a price indication, and when details are determined, Brisbane Wild Diamonds Fun Casino can provide you with a price quote. Our rates are very competitive, but entertaining your guests is priceless! We have had customers come back to us in the past and say they have had a cheaper quote. But sometimes cheaper is not better. We pride ourselves on having the newest and highest quality casino equipment. Some of our competitors will use toy equipment and trestle tables covered with a curtain. We have $20 million liability which is double any of our opposition just for one example of how we provide extra. Please don’t accept any quote or the pressure sales (which we will never do) without contacting us. If you get back to us we can justify why we may be a little dearer and then try to beat them. You get what you pay for, just like in cars, would you rather have a luxury Mercedes or a cheap old runaround (I wont mention a brand of crap car so’s not to offend), but the point is, they both get you from A-B but one is a lot more reliable and comfortable than the other. Wild diamonds offers the luxury you want your guests to remember you for. There are several companies that work on a “top shelf” level like we do. Unfortunately there are many who just get by with very poor equipment and service. Cost cutting may end in disaster! We had a Lady book a party with a competitor January 2013. She very sheepishly rang us the afternoon before her event. She asked if we could step in as the owner of the company she had booked with was in jail (bikie laws in Queensland). Unfortunately for her we were fully booked that day. We could only offer advice. Her party ended up not being a casino party and she was very disappointed. The company mentioned was an interstate company under local management and have since changed their name in Queensland, probably because of this incident. You will only get one chance to make you event a memorable. Don’t gamble on success, make it a sure thing with Brisbane Wild Diamonds Fun Casino. I thought casinos were illegal in Qld. Are we breaking the law to have a fun casino party? Is a Wild diamonds Fun casino event breaking any laws? No. Our events are perfectly legal because we do not play for ‘real’ money. We provide you with ‘fun money’ that you give to your guests. They exchange that for an equivalent amount of chips that can be used at any table. At the close of the fun casino, players turn in their chips and have bragging rights regarding their winnings. A trophy is awarded to the winning player. Fun casinos are run for entertainment purposes only. We are paid a fixed fee for our services and your guests are attending a private function. At a charity event or fundraiser, the organiser or representative of the charity may be required to get a permit from the govenment to gain permission to hold the event. The events are held in strict accordance with the government regulations which we can provide on request. Guests at a fund raising event can purchase more fun money in order to support the charity. The Wild Diamonds Fun Casino staff do not handle the real money and it is never accepted over the table, only through a designated charity representative. There are very large fines and penalties for us and the venue if any of the government regulations are breached. We are happy to talk to you about your individual requirements and work out ways that ensure no laws are being broken. Should I tip the Fun Casino dealers? Unlike in a real Australian casino, Wild diamonds staff are allowed to take tips. You may tip the dealers if you wish, but It is not customary to tip in Australia. Our Fun Casino dealers are all friendly and outgoing. They work to ensure that your guests have an enjoyable casino experience. If you feel that a dealer has been extra ordinary in their service to you, you are welcome to reward them personally or as a group. This can be anything from a monetary reward to a drink after the fun casino has finished. We often receive reviews from our customers and their guests after an event. Feedback will always be passed onto our Fun casino dealers and other staff received following an event. We also encourage our clients to leave a review on Google plus, or our Facebook page (we have just revived it as at March 2016) or to email us personally. Weask that if you are happy with your event on completion, please recommend our business to your friends and co-workers. What casino games does Wild Diamonds Fun Casino offer? Brisbane Fun Casino and Wild Diamonds Fun Casino offers all of the popular and well known casino games. Casino games on offer are Blackjack, Roulette, Craps, Money Wheel (sometimes called big wheel or Chocolate wheel) and Texas Hold’em Poker. Other types of poker can be organised by prior negotiation. We also plan to offer other games as demand for those games rises. Sic Bo will be introduced soon (late 2017). Please go to our “how to Play” page on this site to see images and instructions for our casino games. Fun Casino games are played in the same way as they are in a real casino. Being a “Fun Casino”, Wild Diamonds Fun Casino (Brisbane Fun casino) will sometimes make some minor changes to ensure a higher level of enjoyment for our players. We have also added a Photo kiosk to our list of casino entertainment options. It is a simple stand alone machine that is self operated. We don’t supply an operator, and we have also eliminated the printer due to all the pictures being left behind by the guests. Instead we email them to the function organiser. Our costs are $100-$150 depending on the number of casino games tables you have hired. For more info and some examples of the pictures, please go to our Photo Kiosk page. We guarantee this is a lot cheaper than any Photo Booth company, but with the same end result, a lot of fun images to remember you event. What do I need to supply to hold a Fun Casino event? Brisbane Wild Diamonds Fun Casino event’s will supply the luxury tables. 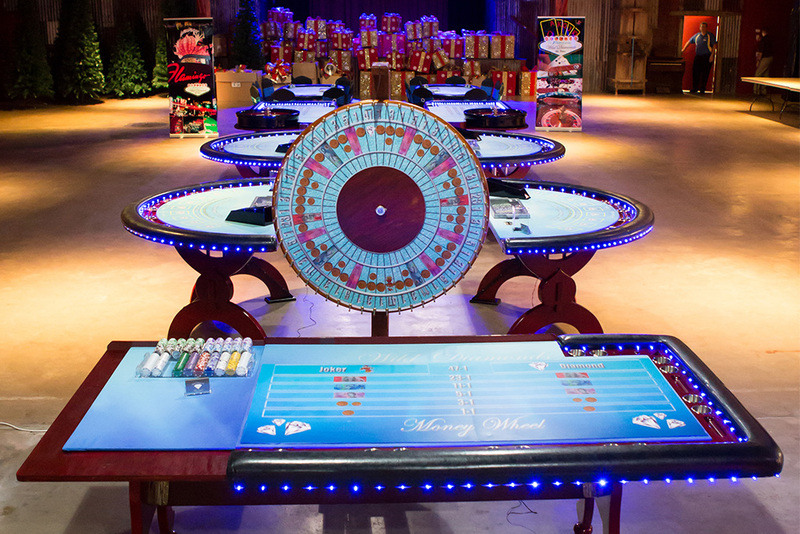 This includes delivery and set up, professional croupiers, ‘fun money’ and other agreed theme props. We also provide (if required) a “Red carpet entrance” complete with gold bollards and red ropes. Your grand entance can also have a “Blue carpet entrance” with silver bollards and blue ropes. Please provide 11 chairs if you have hired a Poker table. Otherwise all you need to provide is your chosen venue, food, drink and guests. We require a parking space within reasonable distance to the area the Fun Casino is to held and of course reasonable access. You need to organise your own venue and deal with the venue manager in regards to times, food, drinks etc. We can recommend a venue if you are not having it at home and don’t know of an appropriate venue for your function. Of course, you need to provide the guests and it is always good to have a dress up theme and encourage your guests to wear something a little different if it is an unusual theme like “Friday 13th Horror”, or “Groovy 70’s”, but even a Vegas theme will often see most guests dress up for the occasion. What if I want to extend the casino party at the last minute? A Brisbane Fun Casino party will typically be booked for a duration of 3 hours. Dependant on staff availability, you may request to extend your Fun Casino party for an additional hour for 25% of the contract price. For longer times it may be best to pre-book so we can advise the croupiers in advance. For a 5 hour casino or more, we may need to include a short break for the staff (10 minutes). We have many events that are booked for 4 hours and sometimes for 5 hours. Sometimes your guests are having such a good time that you want it to continue. Just approach the Casino manager 1/2 hour before the set finish time to extend. We have never been unable to accommodate an extension. Every Brisbane Fun Casino event is individual and dependent on many factors, but you can be assured that if you want an extension of your casino party, we will do all in our power to help you out. When do you set up and take down the equipment? Fun Casino equipment set up and removal. Brisbane Wild Diamonds Fun Casino staff will coordinate set up time with you and your venue. All Fun Casino equipment and red carpet entrance (if booked) will be set up prior to the arrival of the guests. This maximises the impact and gives the “wow factor” as guests arrive. Occasionally, due to lack of room, the red carpet is set up in the middle of the tables. It is removed at the start of game play to allow full movement around the tables. Brisbane Fun casino staff will discreetly load out at the end of the casino event usually at an agreed time after the casino games have finished. In many cases, the party continues around us. We remove Fun Casino equipment near dance floors first and usually stack items out of the way. If a client has a particular request to remove tables in a certain way, that’s what we do. Will you come to my house? If so, does it cost extra? A common question: Will you come to my house, or does the event have to take place at a public venue. Yes, We will come to your house. Many of our functions are private parties at private residences. There is no extra charge as long as you live within the Brisbane, Sunshine Coast, Gold Coast area. Other areas by arrangement and subject to staff availability. Wild Diamonds Brisbane fun Casino’s are fully mobile. We have several vehicles and bring all equipment to your chosen venue and set it up. We reserve the right to charge extra if a site check reveals that extra time is required for set up. Examples of this are if several flights of stairs need to be negotiated whilst carrying the equipment, or if we can’t park our vehicle close to the venue. These issues will be raised with you prior to the booking being made. It is at our discretion and will only be applied in extreme cases. We allow a generous amount of time to set up the fun casino’s and pay our set up staff accordingly. We are sure you will understand if circumstances cause this time to extend to the point where the staff need to be paid extra for set up and take down. 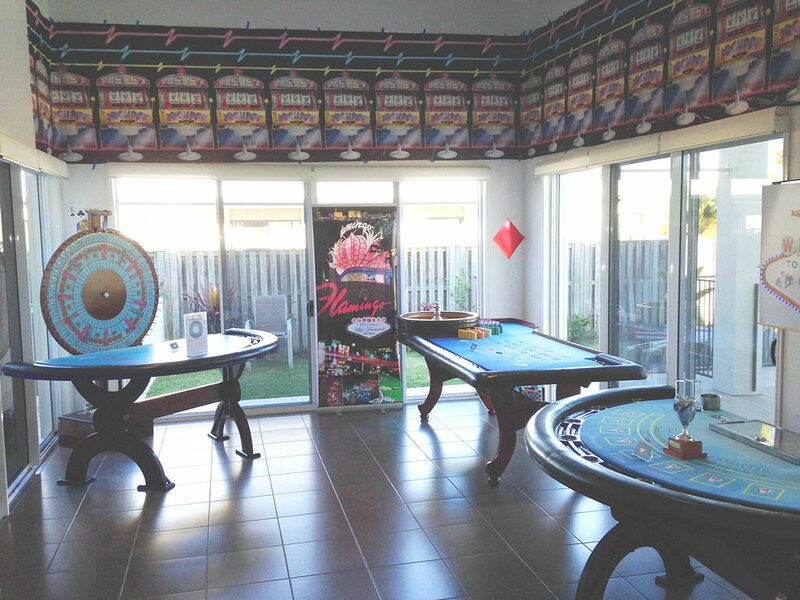 Casino Games at a WIld Diamonds Fun Casino Event in a private residence. Will you travel outside the Sunshine Coast / Brisbane area? Yes, even though we are based on the Sunshine Coast, the road system around Sunshine coast, Brisbane and the Gold Coast is such that we can get to the Gold Coast with zero traffic lights in a reasonable amount of time. This means we can cover most of South East Queensland with no extra costs to our customer. We can also travel north to Gympie, Hervey bay and even as far as Bundaberg. A majority of our work is in the Brisbane region due to the larger population than Sunshine Coast or Gold Coast, but we will look after anywhere that we can get to, even rural and regional areas. We have been to Bundaberg, Hervey Bay and Towoomba to name just a few of the “outside areas” that we are willing to cover. Sometimes there are factors that will increase the costs such as if staff have to travel a long distance, but we will be happy to discuss your needs and meet or beat the price of any competitor with equivalent offerings. Obviously our ability to offer our services at your function will also depend on the availability of staff. Brisbane Fun Casino’s will make every effort to ensure your event will go ahead, even in the most difficult of circumstances. please call or email to discuss how we can look after you event.